Can orthodontic relapse be blamed on the temporomandibular joint? There are many temporomandibular joint (TMJ) conditions that can cause orthodontic treatment instability and relapse. These conditions are often associated with dentofacial deformities, malocclusion, TMJ pain, headaches, myofascial pain, TMJ and jaw functional impairment, ear symptoms, etc., Many of these TMJ conditions can cause progressive and continuous changes in the occlusion and jaw relationships. Patients with these conditions may benefit from corrective orthodontic and surgical intervention. The difficulty for many clinicians may lie in identifying the presence of a TMJ condition, diagnosing the specific TMJ pathology, and selecting the proper treatment for that condition. This paper will discuss the most common TMJ pathologies that can adversely affect orthodontic stability and outcomes as well as present the treatment considerations to correct the specific TMJ conditions and associated jaw deformities to provide stable and predictable treatment results. There are many temporomandibular joint (TMJ) conditions that can cause orthodontic treatment instability and relapse. The most common of these conditions include: (1) Articular disc dislocation, (2) Reactive arthritis, (3) Adolescent Internal Condylar Resorption (AICR), (4) Condylar hyperplasia (CH), and (5) End-stage TMJ pathology (i.e, connective tissue/autoimmune diseases, advanced reactive arthritis and osteoarthritis, traumatic injuries, ankylosis, etc.). These conditions are often associated with dentofacial deformities, malocclusion, TMJ pain, headaches, myofascial pain, TMJ and jaw functional impairment, ear symptoms, etc., Many of these TMJ conditions can cause progressive and continuous changes in the occlusion and jaw relationships. Patients with these conditions may benefit from corrective orthodontic and surgical intervention. The difficulty for many clinicians may lie in identifying the presence of a TMJ condition, diagnosing the specific TMJ pathology, and selecting the proper treatment for that condition. This paper will discuss the most common TMJ pathologies that can adversely affect orthodontic stability and outcomes as well as present the treatment considerations to correct the specific TMJ conditions and associated jaw deformities to provide stable and predictable treatment results. Why Blame the Temporomandibular Joints for Relapse? The TMJs are the foundation and support for jaw position, function, occlusion, and facial balance necessary for quality treatment outcomes in orthodontics and orthognathic surgery. If the TMJs are not stable and healthy (nonpathological), treatment outcomes may be unsatisfactory relative to function, esthetics, stability, and pain. Contrary to popular belief, orthognathic surgery to correct a malocclusion and jaw deformity will not "fix" or eliminate co-existing TMJ pathology and symptoms. Our studies , and those of others, ,,,, demonstrate that performing orthognathic surgery only on patients with co-existing TMJ pathology, can result in unsatisfactory treatment outcomes such as relapse, malocclusion, TMJ pain, headaches, myofascial pain, and masticatory dysfunction. The above listed TMJ conditions, when occurring with dentofacial deformities, can be predictably treated by performing the appropriate TMJ surgery and orthognathic surgery at one operation. Performing the TMJ and orthognathic surgery at separate operations can also treat these TMJ conditions, but the TMJ surgery should be done at the first operation. Clinical, radiographic imaging, dental model, magnetic resonance imaging (MRI) and/or computed tomography scan evaluations, as well as patient history, are very important for accurate diagnosis of the TMJ pathology and treatment planning. With appropriate selection and execution of the orthodontics and surgical procedures, as well as proper postsurgical management, good outcomes can usually be achieved. Our research studies , evaluated 25 consecutive patients with jaw deformities and anteriorly displaced discs requiring mandibular advancement, treated with double jaw orthognathic surgery only. Presurgery, 36% of the patients, had pain or discomfort. At an average of 2.2 year's postsurgery, 84% of the patients had TMJ related pain, with a 70% increase in pain severity. In addition, 25% of the patients developed anterior open bites from condylar resorption. Twelve patients (48%) required TMJ surgery and repeat orthognathic surgery. Nine additional patients (36%) required long-term medications and/or splint therapy for pain control. This study clearly demonstrates the problems associated with performing orthognathic surgery only on patients with co-existing TMJ disc dislocations. Temporomandibular joint surgery (i.e, disc repositioning, arthroplasties, high condylectomies, etc.) can significantly alter the position of the mandible and the occlusion. 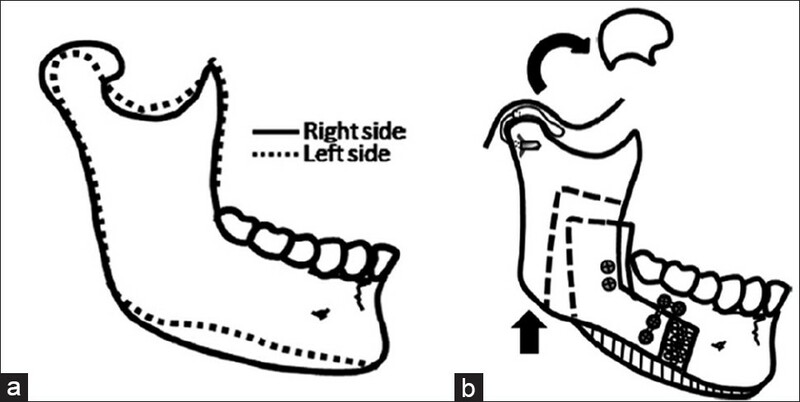 Therefore, the surgical sequencing for performing TMJ and orthognathic surgery at one operation or divided into two operations (the TMJ and orthognathic procedures are done separately) is important to achieve good outcomes and includes: TMJ surgery first, followed by mandibular ramus sagittal split osteotomies with rigid fixation, and then if indicated, maxillary osteotomies with rigid fixation. With the mandibular osteotomies being performed after the TMJ surgery, the mandible will be positioned into its predetermined position regardless of the amount of mandibular displacement resulting from the TMJ surgery. The jaws are not wired together postsurgery since rigid fixation (bone plates and screws) is used to stabilize the osteotomy sites. Light vertical elastics (3/16 inch, 3½ ounce) with a slight Class III vector are usually used postsurgery to control the occlusion and minimize intercapsular edema. Closely monitoring and managing the occlusion in the postsurgery period as well as controlling the para-functional habits (i.e, clenching, bruxism), are very important to provide quality outcomes. Open TMJ surgery provides direct access to the TMJ allowing manipulation, repair, removal and/or reconstruction of the anatomical structures that cannot be accomplished by other means such as arthroscopy, arthrocentesis, splint therapy, orthodontics, or other nonsurgical treatment modalities. The author uses minimally invasive open joint surgical approaches to the TMJ that utilize small incisions and minimizes soft tissue reflection from the condyle, thus maximizing the vascular supply to the condyle. Although arthroscopy and arthrocentesis may have a role in some TMJ conditions, these procedures are contra-indicated when jaw deformities co-exist and orthognathic surgery is required. Arthroscopy and arthrocentesis do not reposition the articular disc into a proper anatomical position with adequate stabilization to withstand the increased TMJ loading that is unavoidable in orthognathic surgery, particularly with mandibular advancements. Rather, arthroscopy and arthrocentesis tend to displace the disc further. The benefits of simultaneous TMJ and orthognathic surgery include: (1) Requires one operation and general anesthetic; (2) Eliminates the TMJ pathology; (3) Balances the occlusion, TMJs, jaws, and neuromuscular structures, at the same time; and (4) Decreases overall treatment time. Our research studies ,,,,,,,,,,,,,,, have shown that simultaneous surgical correction of TMJ pathology and co-existing dentofacial deformities, in one operation, provides high-quality treatment outcomes for patients relative to function, esthetics, elimination or significant reduction in pain, outcome stability, and patient satisfaction. Equivalent results can also be achieved by separating the TMJ and orthognathic surgical procedures into two operations, but the TMJ surgery should be performed first, with at least 6 months before performing the orthognathic surgery procedures. The most common TMJ pathology is an anterior displaced disc [Figure 1]a. This condition can initiate a cascade of events leading to arthritis and TMJ related symptoms. Simultaneous surgical treatment would include; reposition the TMJ disc into a normal anatomical, functional position and stabilize it using the Mitek anchor (Mitek Surgical Products Inc., Westwood, MA) technique, ,,,, and then perform the indicated orthognathic surgery. The Mitek anchor technique uses a bone anchor that is placed into the lateral aspect of the posterior head of the condyle with subsequent osseo-integration of the anchor. Two 0-Ethibond sutures (Ethicon Inc., Somerville, NJ, US) are attached to the anchor and are used as artificial ligaments to secure and stabilize the disc to the condylar head [Figure 1]b-d.
Our study  using this treatment protocol on 70 patients demonstrated a 91% success rate relative to good TMJ and jaw function, stable skeletal and occlusal relationships, and significant reduction in pain. The success rate was significantly better (95%) if the TMJ discs were surgically repositioned within the first 4 years of onset of the TMJ dysfunction. After 4 years, the progression of irreversible TMJ degenerative changes may result in a lower success rate. Another of our studies  evaluated 88 different patients with simultaneous TMJ disc repositioning with the Mitek anchor and orthognathic surgery that likewise demonstrated a very similar statistically significant decrease in TMJ pain and headaches, while improving jaw function, and providing stable occlusal and skeletal results. Most patients with mild to moderate reactive arthritis, without significant involvement of other body systems, may respond well to articular disc repositioning using the Mitek anchor system [Figure 1] and the appropriate orthognathic surgery procedures, providing the discs are salvageable and within 4 years of the onset of the TMJ problems. It is possible that the resection and removal of a large portion of the bilaminar tissue (where it is known that these bacteria reside) during surgery may result in a significant reduction of the source of the inflammation. In more advanced reactive arthritis cases, particularly those with significant destruction of the TMJ structures (i.e, disc, condyle, fossa) and/or involvement of other body systems, the best TMJ treatment may be a reconstruction with a total joint prosthesis (TMJ concepts Inc., Ventura, CA, US), [Figure 2]a and b.
Adolescent Internal Condylar Resorption is a pathological, hormonally mediated condition primarily affecting teenage females (ratio 9:1, females to males), initiated as they enter their pubertal growth phase. Patients with AICR have a classic facial morphology: (1) Retruded mandible, (2) High occlusal plane angle, and (3) Tendency for a Class II open bite that worsens with time [Figure 3]a-c, [Figure 4]a-c and [Figure 6]a. No other joints are involved with this pathology, and there is a genetic correlation. In AICR, it is postulated that the female hormones stimulate the hyperplasia of the synovial tissues that then produce chemical substrates that destroy the ligaments that normally stabilize the disc to the condyle. The disc becomes anteriorly displaced, and the condyle is then surrounded by the hyperplastic synovial tissue that continues to release chemical substrates that penetrate the condylar head causing internal condylar resorption, creating a slow but progressive decrease in size of the condyle and retrusion of the mandible [Figure 5]. In AICR, the condylar resorption is internal with inward collapse of the overlying thinned cortical bone and fibrocartilage. Other TMJ resorptive pathologies resorb the condyle from the outside. Interestingly, 25% of the patients with AICR are asymptomatic relative to pain and joint noises increasing the challenge for diagnosis. This 19-year-old female had onset of TMJ problems at the age of 14. The diagnoses are as follows: (1) Bilateral TMJ AICR, (2) Mandibular AP hypoplasia, (3) Maxillary anterior vertical hyperplasia, posterior vertical and transverse hypoplasia, (4) Class II end-on occlusion, (5) Anterior open bite of 3 mm, (6) Hypertrophied turbinates causing nasal airway obstruction, (7) Severe TMJ pain, myofascial pain and headaches [Figure 3]a-c, [Figure 4]a-c, [Figure 5]a and [Figure 6]a. Surgery consisted of the following: (1) Bilateral TMJ articular disc repositioning and ligament repair with Mitek anchors. (2) Bilateral mandibular ramus sagittal split osteotomies to advance the mandible in a counter-clockwise direction, (3) Multiple maxillary osteotomies to advance in a counter-clockwise direction and expand, (4) Vertical reduction AP augmentation genioplasty, (5) Bilateral partial inferior turbinates. 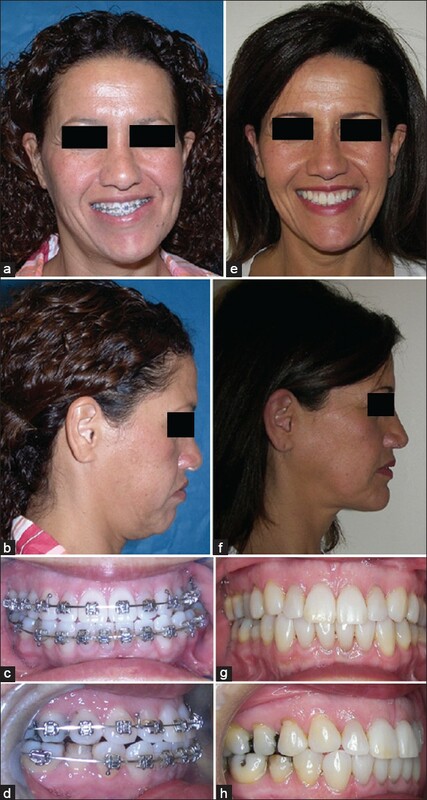 The patient is seen 2½ years postsurgery with improved facial balance and stable jaw and occlusal relationship, and elimination of pain [Figure 3]d-f, [Figure 4]d-f, [Figure 6]b. The only treatment protocol proven to eliminate the TMJ pathology and allow optimal correction of the associated dentofacial deformity, was developed by the author , and includes: (1) Removal of the hyperplastic bilaminar and synovial tissues around the condyle; (2) Reposition and stabilize the disc to the condyle with the Mitek anchor technique [Figure 1]; and (3) perform the indicated orthognathic surgery [Figure 6]b. Our initial study  involved 12 patients with active AICR, who underwent simultaneous TMJ and double jaw orthognathic surgery. The average postsurgical follow-up was 33 months, with very stable results, excellent jaw and masticatory function, and elimination or significant reduction in pain in all patients. Our more recent study  evaluated 44 patients with active AICR, divided into two groups. 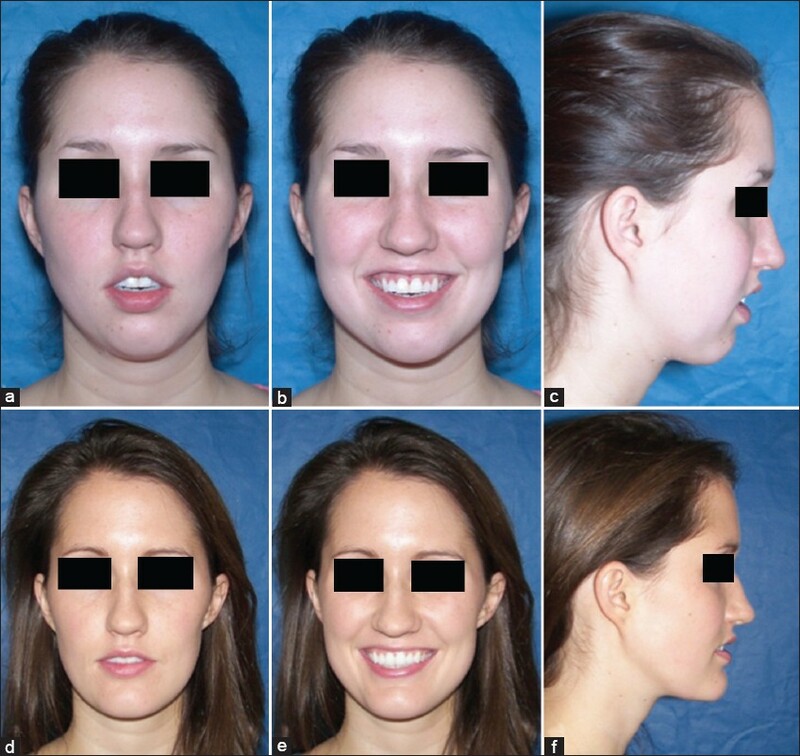 Group 1 (n = 10) underwent orthognathic surgery only, with no TMJ surgical treatment. 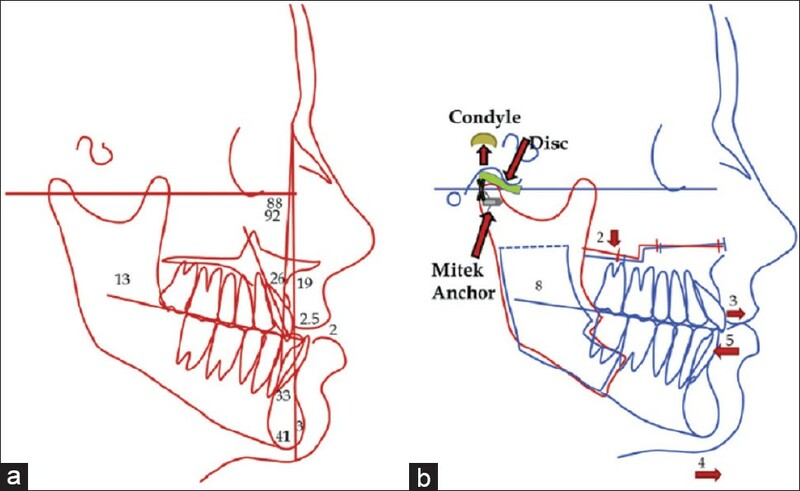 Group 2 (n = 34) underwent TMJ disc repositioning with the Mitek anchor technique and simultaneous orthognathic surgery. In Group 1, AICR continued in all 10 patients postsurgery resulting in statistically significant skeletal and occlusal instability and relapse. Group 2 patients, all maintained stable Class I skeletal and occlusal outcomes, with statistically significant reduced pain, and improved jaw function, compared to Group 1. Condylar hyperplasia indicates pathological enlargement of the mandibular condyle. Normal facial and jaw growth is usually 98% complete in females at age 15 years, and in males at age 17-18 years. CH Type 1 is an accelerated and prolonged growth condition of the "normal" condylar growth mechanism creating mandible (prognathism), often continuing into the patient's mid 20's, but is self-limiting [Figure 7]a-c. Bilateral occurrence is classified as CH Type 1A causing progressive and worsening prognathism, but relatively asymptomatic for TMJ symptoms. On MRI, the articular discs in CH Type 1A patients are commonly very thin and sometimes very difficult to identify. The condylar heads and necks are usually excessively long. The unilateral condition is classified as CH Type 1B that can cause progressively worsening deviated prognathism, facial asymmetry, disc dislocation and arthritic changes on the contra-lateral side, TMJ pain, headaches, masticatory dysfunction, etc. Not all prognathic mandibles are caused by CH; only those demonstrating accelerated, excessive mandibular growth and/or growth continuing beyond the normal growth years. Differential diagnosis includes; prognathism with normal growth of the jaws, or deficient maxillary growth with a normal growing mandible. The treatment protocol developed by the author , for these CH Type 1 includes: (1) High condylectomy to arrest the condylar growth; (2) TMJ disc repositioning over remaining condyle; and (3) Simultaneous orthognathic surgery [Figure 8]b, [Figure 9]. This protocol predictably stops mandibular growth and provides highly predictable and stable outcomes with normal jaw function and good esthetics. Our previous study  presented 54 patients (32 females, 22 males) with confirmed active CH Type 1, average age 17 years, followed for 5 years postsurgery, and divided into two groups. 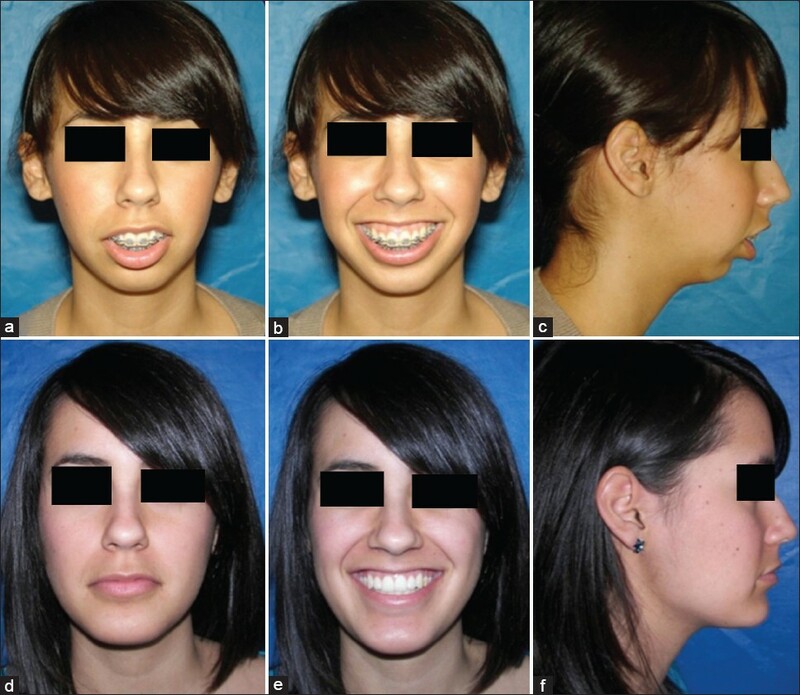 Group 1 patients (n = 12) were treated with orthognathic surgery only, and Group 2 patients (n = 42) were treated with simultaneous high condylectomies, discs repositioned over the remaining condyle, and orthognathic surgery. All patients in Group 1 redeveloped skeletal and occlusal Class III relationships. In Group 2, all 42 patients remained in a stable Class I skeletal and occlusal relationship with normal jaw function. [Figure 7]: (a-d) A 14-year-old girl with (1) CH Type 1, onset age 11 years, greater growth on the left side and right disc anterior dislocation; (2) Mandibular deviated prognathism; (3) Maxillary hypoplasia; (4) Class III occlusion, greater on the left; (5) Impacted third molars; and (6) TMJ pain and headaches. Single-stage surgery included: (1) Bilateral TMJ high condylectomies with disc repositioning using Mitek anchors; (2) Mandibular ramus osteotomies to correct the asymmetry, set mandible posteriorly, and decrease the occlusal plane angle; (3) Maxillary osteotomies to advance and expand; and (4) Removal of 4 third molars. (e-h) At 2.5 years after surgery, the patient was pain free with good facial balance, occlusion, and airways, and mandibular condylar growth was eliminated. [Figure 8]: (a) Cephalometric analysis shows the Class III skeletal and occlusal relationship, mandibular prognathism, and maxillary hypoplasia. (b) Prediction tracing shows high condylectomies, repositioning the articular discs with Mitek anchors, mandibular repositioning, and maxillary advancement. [Figure 9]: (a) Outline of high condylectomy. (b) Top of condyle removed, articular disc repositioned over the remaining condyle fixed with a Mitek anchor. Condylar hyperplasia Type 2 is a unilateral mandibular condylar tumor (osteochondroma) that causes enlargement of the mandibular condyle, creating a progressive vertical elongation of the jaws and face, asymmetric dentofacial deformity, malocclusion, and can result in TMJ disc dislocation (usually on the contralateral side), TMJ pain, headaches, and masticatory dysfunction. An osteochondroma produces excessive bone and cartilage that enlarges the condyle [Figure 7]. These tumors can become very large and cause severe dentofacial and occlusal deformities resulting in unilateral excessive vertical facial growth on the tumor side of the jaw. These pathologies can be predictably treated with a low condylectomy, preserving the condylar neck, which is recontoured to function as a "new condyle," and the disc is stabilized to it with a Mitek anchor [Figure 3]. Simultaneous orthognathic surgery can be performed to provide optimal functional and esthetic results. Our study  using this protocol showed at 4 years postsurgery, no recurrence of the tumors, jaw structures and occlusions were stable, jaw function was good, and patients were pain-free. [Figure 10]: (a-d) A 45-year-old woman with (1) Right-side CH Type 2 (osteochondroma), onset at age 18 years, with progressive worsening facial asymmetry; (2) Left TMJ arthritis and disc dislocation; (3) Right mandibular and maxillary vertical hyperplasia and asymmetry; (4) Transverse cant in the occlusal plane; (5) Chin midline shifted 13 mm to the left; and (6) Severe TMJ pain, headaches, and myofascial pain. (e-h) Single-stage surgery included (1) Right mandibular low condylectomy; (2) Bilateral TMJ disc repositioning with Mitek anchors; (3) Bilateral ramus osteotomies to shift the mandible back to the facial midline and level transversely; (4) Multiple maxillary osteotomies for alignment; (5) Right inferior border ostectomy; to improve vertical facial balance and (6) Genioplasty. 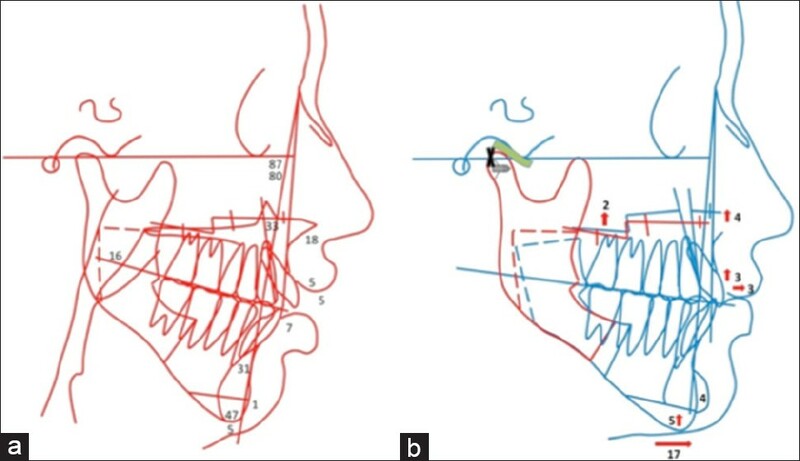 [Figure 11]: (a) Cephalometric tracing shows the vertical difference between the elongated mandibular right side and at the occlusal plane. (b) Prediction tracing shows right low condylectomy and bilateral disc repositioning with a Mitek anchor, double jaw orthognathic surgery, genioplasty, and ostectomy of right inferior border with preservation of the inferior alveolar nerve. [Figure 12]: (a) Osteochondroma causing enlargement of the condyle and vertical elongation of mandible (solid line). (b) Low condylectomy to remove tumor, disc repositioning over remaining condyle, mandibular osteotomies, and inferior border osteotomy to balance vertical height. Most cases will also benefit from maxillary osteotomies for optimal treatment outcomes. Our studies ,, have shown very good outcomes in treating these end-stage TMJ conditions and diseases with custom-made total joint prostheses (TMJ Concepts system) for TMJ reconstruction and mandibular advancement, as well as simultaneous maxillary orthognathic surgery. The quality of results decreases as the number of previous TMJ surgeries increases, particularly in reference to pain relief. When the TMJ Concepts total joint prostheses system is used as the first or second TMJ surgery, the success rate is very good relative to jaw function, stability, facial balance, and pain relief. [Figure 13] and [Figure 14]: (a-c) This 18-year-old female presented with: (1) Juvenile rheumatoid arthritis (JRA); (2) Bilateral TMJ involvement with significant and progressive condylar resorption; (3) Class II skeletal and occlusal dentofacial deformity; (4) Anterior open bite; and (5) Decreased oropharyngeal airway with sleep apnea symptoms. Following orthodontic preparation, surgery was performed which consisted of: (1) Bilateral TMJ reconstruction and mandibular counter-clockwise advancement with custom-fitted TMJ total joint prostheses (TMJ Concepts system; [Figure 2]); (2) Bilateral TMJ fat grafts (harvest from abdomen) packed around the functional component of the prostheses; (3) Bilateral coronoidectomies; (4) Multiple maxillary osteotomies to move anterior aspect upward, down graft the posterior aspect and upright the incisors [Figure 15]b; and (5) Chin augmentation with an alloplastic implant. (d-f) 2 years postsurgery evaluation demonstrates a good stable, functional and esthetic outcome. [Figure 15]: (a) The presurgery cephalometric analysis demonstrates the severe deformity and decreased oropharyngeal airway. (b) The prediction tracing demonstrates the planned surgical procedures for optimal treatment outcome. During the past two decades, major advancements have been made in TMJ diagnostics and the development of surgical procedures to treat and rehabilitate the pathological, dysfunctional, and painful TMJ. Research has clearly demonstrated that TMJ and orthognathic surgery can be safely and predictably performed at the same operation, but it does necessitate the correct diagnosis and treatment plan, as well as requires the surgeon to have expertise in both TMJ and orthognathic surgery. The surgical procedures can be separated, but the TMJ surgery should be done first. Poor TMJ surgery outcomes are usually related to: Wrong diagnosis, wrong surgical procedure, poorly executed surgery, inadequate follow-up care, and/or unrecognized or untreatable local and/or systemic factors. With the correct diagnosis and treatment plan, the simultaneous TMJ and orthognathic surgical approach provides complete and comprehensive management of patients with co-existing TMJ pathology and dentofacial deformities. Patients who develop significant changes in their occlusion, jaw alignment, and masticatory function (with or without TMJ pain, headaches, myofascial pain, ear symptoms, etc.) commonly have TMJ pathology that is either causing condylar resorption (i.e, AICR, reactive arthritis, connective tissue/autoimmune diseases, etc.) or condylar growth (i.e, CH Types 1 or 2, etc.). Postorthognathic surgery outcome instability (relapse) is usually related to poor surgical technique (jaws improperly positioned or inadequately stabilized) and/or undiagnosed and untreated TMJ pathology. In cases with poorly performed or inadequately stabilized surgical procedures, relapse is usually evident immediately or within 2-3 weeks postsurgery. TMJ pathology that causes "relapse" usually involves condylar resorption or condylar growth and occurs over time, often taking months until the problem is identified. 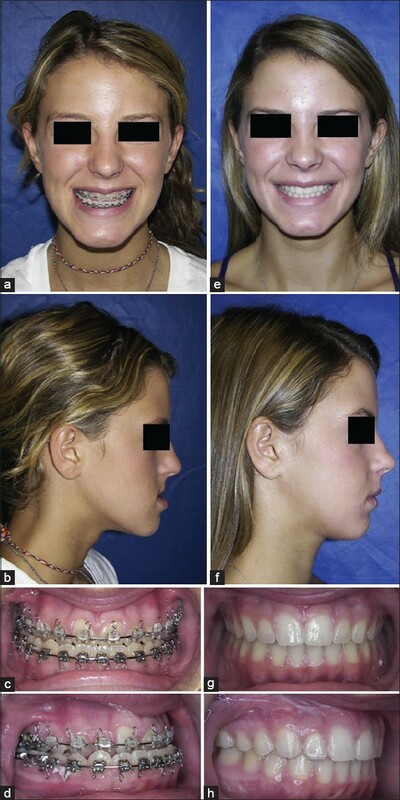 For example: A 15-year-old female undergoes mandibular advancement by a competent surgeon who properly performs the surgery and provides appropriate stabilization with an initially stable result. However, at 1-year postsurgery, the patient develops a Class II anterior open bite as well as headaches and TMJ discomfort, but no other joints are involved. This patient most likely has TMJ AICR with articular disc dislocation that developed as she entered her pubertal growth phase, but was undiagnosed or ignored. A thorough preoperative history, TMJ evaluation, radiographs, and MRI could have diagnosed the condition. Surgical repositioning of the articular discs with Mitek anchors as the initial surgical procedure or performed simultaneous with the orthognathic surgery would have stopped the disease process, eliminated the TMJ pain and headaches, as well as provided a highly predictable and stable treatment outcome. Also on the presurgical differential diagnosis would be other pathological conditions that could cause condylar resorption such as: Connective tissue/autoimmune diseases (i.e, rheumatoid arthritis, psoriatic arthritis, Lupus, Sjogren's syndrome, etc. ), reactive arthritis, or other TMJ resorptive pathosis. Another example: A 19-year-old man had his mandibular prognathism corrected with bilateral mandibular ramus sagittal split osteotomies with a stable immediate postsurgical result. However, at 6 months postsurgery, he began to shift into a Class III end-on occlusal relationship. By 1-year, he was 5 mm Class III and getting progressively worse. This patient has active bilateral CH Type 1 that could continue to grow into the mid-20's. Serial lateral cephalograms and tomograms taken at 6-12 months intervals, presurgery, could have identified CH so that the appropriate TMJ procedure could have been performed at the first surgery. Bilateral mandibular high condylectomies, articular disc repositioning, and the required orthognathic surgery would eliminate the TMJ pathology and provide predictably stable results. To properly treat patients to achieve consistently high quality and predictable outcomes, orthodontists and oral and maxillofacial surgeons must understand the common TMJ pathologies, adverse affects on treatment outcomes if ignored, methods of diagnosis, and the predictable results that can be achieved by application of indicated orthodontic and surgical treatment protocols. Wolford LM, Reiche-Fischel O, Mehra P. Changes in temporomandibular joint dysfunction after orthognathic surgery. 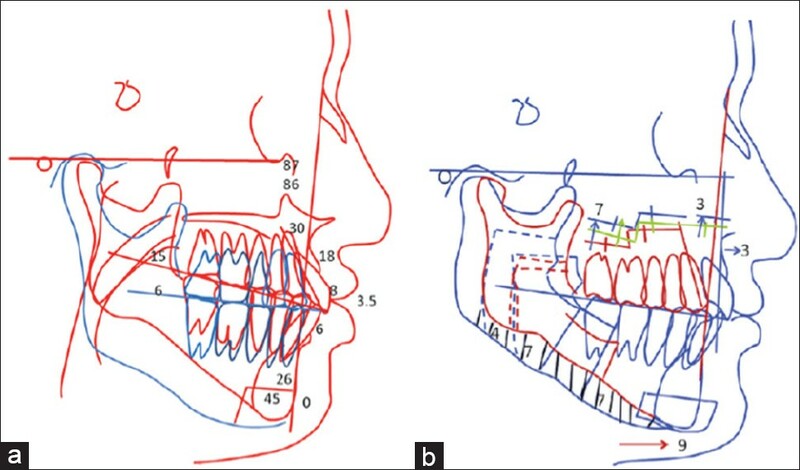 J Oral Maxillofac Surg 2003;61:655-60. Fuselier C, Wolford LM, Pitta M, Talwar R. Condylar changes after orthognathic surgery with untreated TMJ internal derangement. J Oral Maxillofac Surg 1998; Suppl 4 56:61. Kerstens HC, Tuinzing DB, Golding RP, van der Kwast WA. Condylar atrophy and osteoarthrosis after bimaxillary surgery. Oral Surg Oral Med Oral Pathol 1990;69:274-80. Moore KG, Gooris PJ, Stoelinga PJ. The Contributing Role of condylar resorption in orthognathic surgery: A retrospective study. J Oral Maxillofac Surg 1991;49:448-60. De Clercq CA, Neyt LF, Mommaerts MY, Abeloos JV, De Mot BM. Condylar resorption in orthognathic surgery: A retrospective study. Int J Adult Orthodon Orthognath Surg 1994;9:233-40. Arnett GW, Tamborello JA. 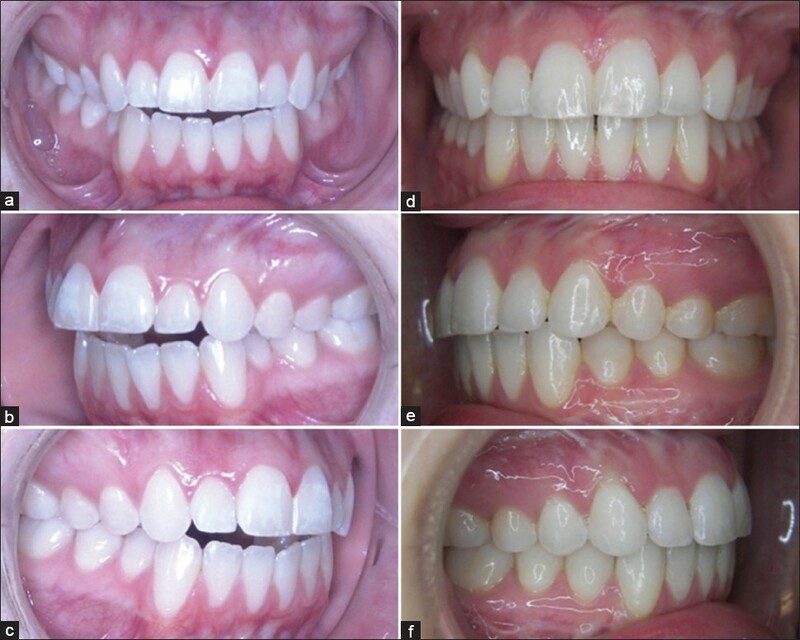 Progressive class II development: Female idiopathic condylar resorption. Oral Maxillofac Surg Clin North Am 1990;2:699-716. Crawford JG, Stoelinga PJ, Blijdorp PA, Brouns JJ. 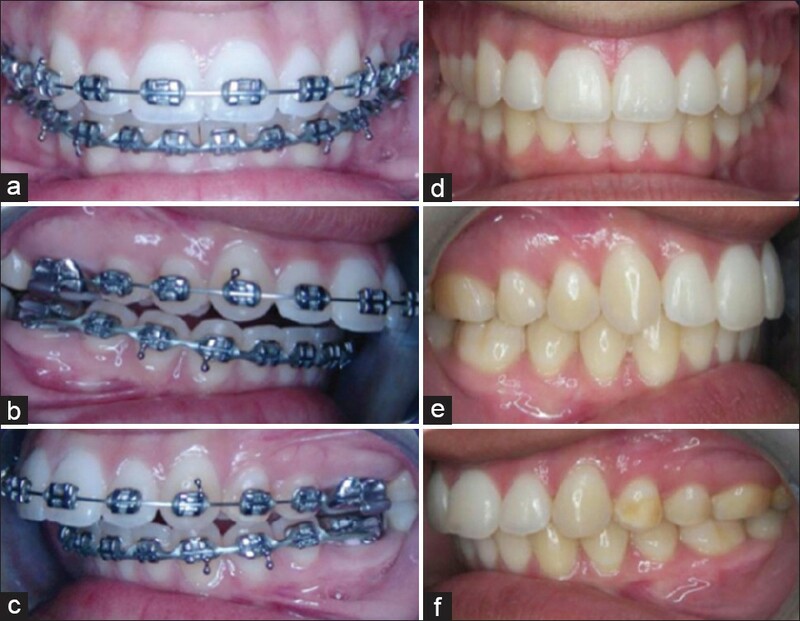 Stability after reoperation for progressive condylar resorption after orthognathic surgery: Report of seven cases. J Oral Maxillofac Surg 1994;52:460-6. Wolford LM, Cottrell DA, Karras SC. Mitek Mini Anchor in Maxillofacial Surgery. Proceedings of SMST-94, the First International Conference on Shape Memory and Superelastic Technologies. Monterey, CA: MIAS; 1995. p. 477-82. Wolford LM. Temporomandibular joint devices: Treatment factors and outcomes. Oral Surg Oral Med Oral Pathol Oral Radiol Endod 1997;83:143-9. Wolford LM, Karras S, Mehra P. Concomitant temporomandibular joint and orthognathic surgery: A preliminary report. J Oral Maxillofac Surg 2002;60:356-62. Mehra P, Wolford LM. 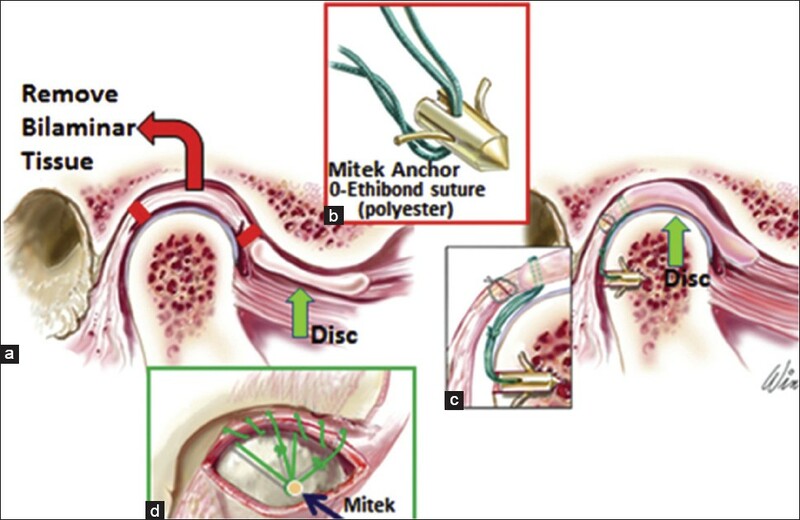 The Mitek mini anchor for TMJ disc repositioning: Surgical technique and results. Int J Oral Maxillofac Surg 2001;30:497-503. Downie MJ, Wolford LM, Morales-Ryan CA. Outcome assessment following simultaneous orthognathic and TMJ surgery. J Oral Maxillofac Surg 2001; Suppl 1 59:51. Wolford LM, Cardenas L. Idiopathic condylar resorption: Diagnosis, treatment protocol, and outcomes. Am J Orthod Dentofacial Orthop 1999;116:667-77. Morales-Ryan CA, Garcia-Morales P, Wolford LM. Idiopathic condylar resorption: Outcome assessment of TMJ disc repositioning and orthognathic surgery. J Oral Maxillofac Surg 2002;Suppl 1 60:53. Wolford LM, Mehra P, Reiche-Fischel O, Morales-Ryan CA, García-Morales P. Efficacy of high condylectomy for management of condylar hyperplasia. Am J Orthod Dentofacial Orthop 2002;121:136-50. Garcia-Morales P, Wolford LM, Mehra P, Reiche-Fischel O, Morales-Ryan CA. Efficacy of high condylectomy for management of condylar hyperplasia. J Oral Maxillofac Surg 2001; Suppl 1 59:106. Wolford LM, Mehra P, Franco P. Use of conservative condylectomy for treatment of osteochondroma of the mandibular condyle. J Oral Maxillofac Surg 2002;60:262-8. Wolford LM, Cottrell DA, Henry CH. Temporomandibular joint reconstruction of the complex patient with the Techmedica custom-made total joint prosthesis. J Oral Maxillofac Surg 1994;52:2-10. Freitas RZ, Mehra P, Wolford LW. Autogenous versus alloplastic TMJ reconstruction in rheumatoid-induced TMJ disease. J Oral Maxillofac Surg 2002; Suppl 1 58:43. Mehra P, Wolford LM. Custom-made TMJ reconstruction and simultaneous mandibular advancement in autoimmune/connective tissue diseases. J Oral Maxillofac Surg 2000; Suppl 1 58:95. Wolford LM, Karras SC. Autologous fat transplantation around temporomandibular joint total joint prostheses: Preliminary treatment outcomes. J Oral Maxillofac Surg 1997;55:245-51. Mercuri LG, Wolford LM, Sanders B, White RD, Giobbie-Hurder A. 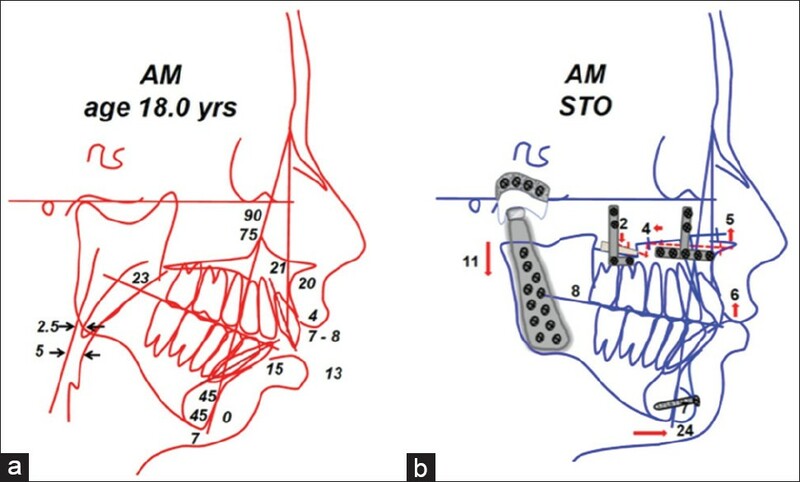 Long-term follow-up of the CAD/CAM patient fitted total temporomandibular joint reconstruction system. J Oral Maxillofac Surg 2002;60:1440-8. Wolford LM, Pitta MC, Reiche-Fischel O, Franco PF. TMJ Concepts/Techmedica custom-made TMJ total joint prosthesis: 5-year follow-up study. Int J Oral Maxillofac Surg 2003;32:268-74. Nickerson JW, Boring G. Natural course of osteoarthrosis as it relates to internal derangement of the temporomandibular joint. Oral Maxillofac Surg Clin North Am 1989;1:27-45. Henry CH, Hudson AP, Gérard HC, Franco PF, Wolford LM. Identification of Chlamydia trachomatis in the human temporomandibular joint. J Oral Maxillofac Surg 1999;57:683-8. Henry CH, Hughes CV, Gérard HC, Hudson AP, Wolford LM. Reactive arthritis: Preliminary microbiologic analysis of the human temporomandibular joint. J Oral Maxillofac Surg 2000;58:1137-42. Henry CH, Pitta MC, Wolford LM. Frequency of chlamydial antibodies in patients with internal derangement of the temporomandibular joint. Oral Surg Oral Med Oral Pathol Oral Radiol Endod 2001;91:287-92. Wolford LM, Gerard HC, Henry CH, Hudson AP. Chlamydia psittaci infection may be involved in development of temporomandibular joint dysfunction. J Oral Maxillofac Surg 2001; Suppl 1 59:30. Hudson AP, Henry C, Wolford L, Gerard HC. Chlamydia psittaci infection may influence development of temporomandibular joint dysfunction. J Arthritis Rheum 2000;43:S174. Henry CH, Wolford LM. Substance P and mast cells: Preliminary histologic analysis of the human temporomandibular joint. Oral Surg Oral Med Oral Pathol Oral Radiol Endod 2001;92:384-9. Henry CH, Nikaein A, Wolford LM. Analysis of human leukocyte antigens in patients with internal derangement of the temporomandibular joint. J Oral Maxillofac Surg 2002;60:778-83. Wolford LM, Henry CH, Goncalves JR. TMJ and systemic affects associated with Chlamydia psittaci. J Oral Maxillofac Surg 2004;62:50-1.